On August 16, Ambassador Liu Xiaoming met with Thomas Heatherwick, CBE, RDI, HonFREng, a renowned British designer, at the Chinese Embassy. Heatherwick extended his congratulations to the Chinese Embassy on the successful purchase of the landmark site of former Royal Mint, and expressed his expectations to contribute ideas and experience to the design and construction of the new premises. He proposed that the new premises should combine both traditional and modern elements to fully present the image of China in the New Era. 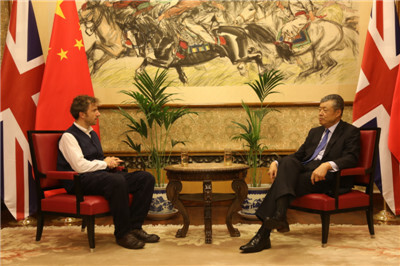 Ambassador Liu thanked Heatherwick for giving constructive advice to the Chinese Embassy, and praised him as a world-renowned designer who designed such masterpieces as the UK Pavilion at the Shanghai World Expo. 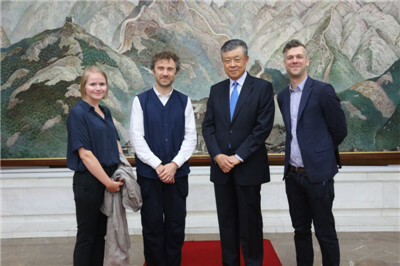 The Ambassador also congratulated Heatherwick and his team on their successful business in China in recent years, and encouraged him to contribute his wisdom to the design and construction of the new premises of the Chinese Embassy.